What is color? Color or colour can be defined as the “visual perceptual property corresponding in humans to the categories called red, green, blue and others.” In other words, color is really what the eye perceives. Color is created by the spectrum of light – which is the distribution of light power vs. wavelength – combining with the spectral sensitivities of the light receptors in the eye. We associate color categories and color’s physical specifications with materials, objects, and light sources; this is based on the color’s physical property, i.e., reflection, light absorption, or emission spectra. The emission spectra of a chemical element or compound is defined by the frequencies at which the element’s or compound’s atoms are emitted when returned to a lower energy rate. When a color space is defined, colors can thus be recognized numerically by their coordinates. How we perceive color is a result from the different and varied spectral sensitivities we have to different types of cone cells in our retinas to different parts of the color spectrum. We define colors to the degree in which they stimulate the cells. While this is a scientific explanation of color quantification, it does not completely explain the psychophysical perception that we have of how colors look. The science of color goes by many names: the simple color science; chromatography; colorimetry; or chromatics. Included in color science is the perception of color by the human brain and eye, color theory in art, the beginnings of color in materials, and the physics of electromagnetic radiation in the visible range (i.e., what we normally call, “light”). Color Physics–We define electromagnetic radiation by its frequency or wavelength and its intensity. There is a spectrum that humans can see – called “visible light” – and it’s approximately between 390 nm – 750 nm. Most light sources will emit light at several varied wavelengths. A spectrum is defined as a distribution of intensity at different wavelengths. There are several possible spectral combinations – more, in fact, than color sensations, even though the spectrum of light that comes to the eye from a given direction determines the color sensation in that direction. Color could actually be defined as a spectra class that “gives rise to the same color sensation, although such classes would vary widely among different species, and to a lesser extent among individuals within the same species.” In these classes, the members are called metamers of the color. Spectral colors – The colors of a rainbow in the color spectrum include all colors produced by visible light of a lone wavelength, which are the pure spectral or monochromatic colors. These colors have a color table with approximate frequencies in terahertz and wavelengths (in nanometers) for different “pure” spectral colors. These wavelengths can be measured in vacuum (i.e., refraction) or in air. This color “table,” however, is not a set list. The pure spectral colors create a perpetual spectrum, and the way it’s separated into clear colors linguistically is a matter of our culture and how people have always perceived colors. There are 6 major bands: red, orange, yellow, green, blue, and violet. 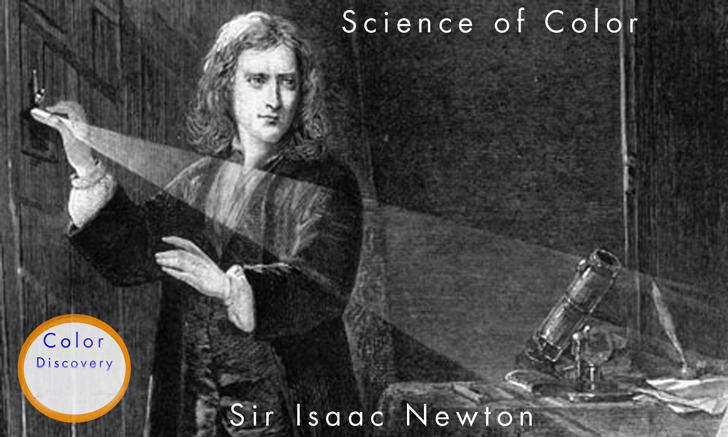 Isaac Newton, who in 1671 named the familiar rainbow colors as “apparitions,” also included a 7th color – indigo, which is between blue and violet. The optical scientists Hardy and Perrin say that indigo is between 446 and 464 nm wavelength. A spectral color’s intensity, which is relative to how it is viewed, may change its perception a fair amount; i.e., a lower-intensity orange-yellow is brown, and a low-intensity yellow-green is olive-green. If light arrives at an opaque surface, it can either be reflected “specularly” (as a mirror reflects), scattered (reflected with diffuse scattering), or absorbed – or, a combination of all three. Opaque objects that usually have rough surfaces, that do not reflect specularly, have colors determined by which wavelengths of light they scatter more and which they scatter less (the light unscattered is absorbed). If objects scatter all wavelengths, then they will appear white. If they absorb all wavelengths, they look black. Opaque objects that will specularly reflect light of different wavelengths with different efficiencies will resemble mirrors tinted with colors determined by those differences. If you have an object that reflects some fraction of encroaching light and absorbs the rest might look black to us, but could also be a little reflective. A good example of this is a black object coated with a layer of lacquer or enamel. If an object transmits light, it’s known to be transparent (not scattering transmitted light) or translucent (scattering the transmitted light). If said object absorbs or reflects light of various wavelengths differentially, it can look like it’s tinted with a color determined by the nature of that absorption or reflectance. Some objects can even emit light that they create themselves, as opposed to just transmitting or reflecting light from other sources.There are a number of reasons why this phenomenon occurs: elevated temperature, which is called chemoluminescence or for various other reasons. Objects can absorb light and then emit light with different properties. They are subsequently called phosphorescent (if light is emitted even following it ceasing to be absorbed; the term also applies to light emitted because of chemical reactions) or fluorescent (if light is sent out only while it’s being absorbed). Basically, an object’s color is a complicated result of its transmission properties, surface properties, and emission properties – all of which contribute to the mix of wavelengths in the light exiting the surface of the object. Then, whatever the results of the perceived color is is further conditioned by the nature of the environmental illumination and by other nearby objects’ color via an effect known as color constancy and other characteristics of the perceiving brain and eye. A mathematical color model was developed in 1931 by an international group of experts called the Commission internationale de l’éclairage(CIE); this model showed the space of observable colors and assigned a set of three numbers to each. How the eye distinguishes color–The human eye is able to distinguish different colors based on the varying sensitivity of different cells in the retina to light of varying wavelengths. Humans are trichromatic, which means that our retinas have three different types of color receptor cells, or cones. There is a type that is distinct from the others, in that it is most responsive to light that we think of as violet, with wavelengths at approximately 420 nm. These cones are called S cones, blue cones, or short-wavelength cones. The other two color receptor cells are closely related chemically and genetically. One is most sensitive to light as we see it in greenish-yellow; these are called L cones, red cones, or long-wavelength cones. These are about 564 nm. The last type is known as middle-wavelength cones, green cones, or M cones; these are most sensitive to light seen as green, with its wavelengths at around 534 nm. Despite light’s complex makeup of wavelengths, it is reduced into three color components by the eye. For every location in the visual field, the three cone types give off three signals based on the extent that each one is stimulated; this is called tristimulus values. If curves in a wavelength for a cone overlap, some of the tristimulus values won’t occur for any incoming light combination; i.e., you cannot stimulate only the mid-wavelength, or “green” cones; other cones will also be stimulated at some point to some degree. The human color space is determined by the set of all possible tristimulus values. Humans can distinguish approximately 10 million individual colors. The other type of light-sensitive cell in the eye is known as a rod, and has a distinct response curve. Usually, when a light’s brightness is such that it strongly stimulates the cones, rods will not contribute to vision. But in dim lighting, the cones are understimulated, which leaves only the signal from the rods; this results in a colorless response (the roads aren’t sensitive to light in the “red” zone). In some conditions of intermediate illumination, a weak cone response and the rod response can work together to result in color bias that aren’t accounted for by only cone responses. The combined effect can be seen in the Kruithof curve, which describes the color perception change and the attractiveness of light as a function of intensity and temperature. How the brain perceives color – A major color vision theory states that “color information is transmitted out of the eye by three opponent processes, or opponent channels, each constructed from the raw output of the cones: a red-green channel, a blue-yellow channel, and a black-white ‘luminance’ channel.” Neurobiology supports the theory and accounts for the “structure of our subjective color experience.” This theory expressly explains why we can’t perceive a “yellowish blue” or “reddish green,” and it predicts the color wheel, or the collection of colors in which at least one of the two color channels measures a value at one of its extremes. A continual philosophical dispute, color’s exact nature and our perception of it is beyond what was previously discussed, as is color’s status as a feature of the perceived world. Color blindness – To be color deficient or color blind, a person’s color-sensing cones (one or more types) are either missing or not as responsive to incoming light, so that the person can’t distinguish as many colors. Certain kinds of color deficiencies are caused by anomalies in the number or nature of retina cones. Other types of deficiencies are caused by neural anomalies in the parts of the brain where visual processing occurs. Tetrachromacy–Most of us, as humans, are trichromatic (with three types of color receptors). Many animals, called tetrachromats, have four types of receptors. These animals include most marsupials, reptiles, birds, some species of spiders, and many species of fish. Other species are only sensitive to two axes of color or don’t see color at all – these animals are called dichromats and monochromats, respectively. There is a distinction between retinal tetrachromacy and functional tetrachromacy. Retinal tetrachromacy has four pigments in cone cells in the retina, as opposed to three in trichromats; functional tetrachromacy means that they have the ability make enhanced color discriminations based on that retinal difference. Almost half of all women are retinal tetrachromats. This phenomenon happens when an individual gets two different copies of the gene for either the medium- or long-wavelength cones, which are carried on the x-chromosome. In order to carry two different genes, a person must have two x-chromosomes, which is why only women have it. Some of these retinal tetrachromats’ color discriminations are enhanced, which then makes them functional tetrachromats. Synesthesia–Perceiving numbers and letters in certain forms of synesthesia, or hearing music (music is color synesthesia) can lead to the strange but wonderful experience of seeing colors. Behavioral and functional neuroimaging experiments have shown that color experiences like these can change behavioral tasks and lead to increased activation of brain regions that experience color perception. Afterimages–Photoreceptors of a certain type will become desensitized after being exposed to strong light in their sensitivity range. This means that a few seconds after the light disappears, the photoreceptors will still signal – only less fully than they normally would. The colors that are seen during this period of time will seem to not have the color component detected by the desensitized photoreceptors. This phenomenon is known as the “afterimage,” in which the eye may still see a bright figure after looking away from it, but always in a complementary color. Afterimages can be seen in the works of artists like Vincent van Gogh. Color constancy – This abnormality occurs when an artist uses a limited color palette; the eye then makes up to it by seeing any gray or neutral color as the color that is missing from the color wheel. A good example is, in a limited palette made up of red, yellow, black and white, a mixture of yellow and black will look like a variety of green; a mix of red and black will appear as purple; and pure gray will look blue. The previously discussed trichromatic theory is very true when the visual system is in a fixed state of adaptation; but really, the visual system is continuously adjusting to changes in the environment and compares different colors in a scene to cut down on the illumination effect. If a scene is illuminated with one light following another, as long as the difference between the light origins remains in a reasonable range, the colors in the scene appear relatively constant to humans. Edwin Land studied this effect in the 1970s, and it led to his retinex theory of color constancy. But take note – both of the above described phenomena are easily explained and even have mathematical models with modern chromatic adaptation and color appearance theories (CIECAM02, iCAM). We shouldn’t cast aside the trichromatic theory of vision, but enhance it with a knowledge of how the visual system adjusts to changes in a viewing environment. There’s a very interesting 1969 study on Basic Color Terms: Their Universality and Evolution by Brent Berlin and Paul Kay. Berlin and Kay describe a pattern in naming “basic” colors; i.e., “red,” but not “red-orange” or “dark red” or “blood red,” which are all “shades” of red. Every language has two “basic” color names to distinguish bright/warm colors from dark/cool colors. Typically, the next colors to be recognized are red, yellow, and green (in order). All languages that have six “basic” colors include white, black, green, red, yellow, and blue. This pattern is part of a twelve-set: gray, black, pink, red, white, yellow, orange, blue, green, purple, brown, and azure (different from blue in Russian and Italian – not English). Color associations–People have created many cultural associations with colors, such as national colors (generally described in individual color symbolism and color articles). There is a filed called color psychology, which tries to identify the effects of color on human activity and emotion. There’s even a form of alternative medicine attributed to several Eastern cultures called, “chromotherapy.” Different colors even effect cognition; for example, at the University of Linz in Austria, researchers found that the color red significantly decreases cognitive functioning in men (perhaps this is why women are found of red dresses). Different wavelengths of light make up most light sources. These sources can have a spectral color, since the eye can’t distinguish them from monochromatic sources. A good example of this is computer displays, which reproduce the spectral color orange as a combination of green and red light – it can appear orange because the green and red are mixed in the best proportions to allow the eye’s red and green cones to respond in the same way they do to the color orange. We can better understand this by looking at the concept of perceived color of a non-monochromatic light source as the dominant wavelength; this identifies the single wavelength of light that creates a sensation most similar to the light source (dominant wavelength is similar to hue). There are color perceptions, which, by definition, can’t be pure spectral colors because of the desaturation or because they are purples (mixes of red and violet light from opposite ends of the spectrum). Necessarily non-spectral colors are the achromatic colors (gray, white, and black) and colors like tan, pink, and magenta. If you have two different light spectra with the same effect on the three color receptors in the human eye, then they will be seen as the same color. This is demonstrated by the white light that comes from fluorescent lamps, which usually has a few narrow bands as its spectrum, while daylight has a continual spectrum. Our human eyes can’t tell the difference between light spectra like this just by looking into the light source (though reflected colors from objects can look different – this is often used in advertising to make fruit or tomatoes look more bright red, for example). In this manner, most human color perceptions can be generated by a mix of three colors called primaries. These primaries are used to produce color scenes in printing, photography, television, and other media. 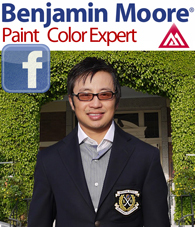 There are many ways (or color spaces) for specifying a color in terms of three particular primary colors. Every method has its disadvantages and advantages (depending on what the application is). However, no mix of colors can create a fully pure color perceived as totally identical to a spectral color; no one can get very close for the longer wavelengths, where the chromaticity diagram has a very nearly straight edge. A good example is mixing green light (530 nm) and blue light (460 nm); this creates cyan light that is a bit watered down, since the response of the red color receptor would be greater to the green and blue light in the mix than it would be to a pure cyan light at 485 nm with the same intensity as the mixture of green and blue. Because of this phenomena, and since the primaries in the color printing systems usually aren’t pure either, the colors reproduced are never perfectly saturated, so spectral colors can’t be exact matches. But since natural scenes hardly ever have fully saturated colors, they can be approximated well by these systems. The available range of colors that can be reproduced with a given color reproduction system is called the gamut; the CIA chromaticity diagram can be used to explain the gamut. Color reproduction systems have other issues as well, like problems with the acquisition devices, like scanners or cameras. The properties of the color sensors in such devices, can be very different from the characteristics of the receptors in the eye. Essentially, the acquisition of colors that have special or “jagged” spectra caused by strange lighting can look poor. There are species that have different color receptors from human, like birds that may have four receptors. These species can differentiate certain colors that look identical to a human. In these cases, a color reproduction system that is attuned to the human eye with normal color vision might give inaccurate results for other viewers. If not correctly handled, different color response of different devices can cause problems. If color information is transferred and stored digitally, color management techniques like those based on ICC profiles can help avoid distortions of reproduced colors. Knowing how to manage color does not necessarily help one navigate the gamut limitations of particular output devices, but it can assist in discovering good mapping of input colors into the gamut that can be reproduced. Reflective media and pigments–Pigments are essentially chemicals that choose what light spectra to absorb and reflect. If a surface is painted with pigment, light that hits the surface is reflected, minus some wavelengths. This taking away of the wavelengths creates the look of different colors. Many paints are blends of several chemical pigments; the intention is to create a reflection of a certain color. Pigment creators will assume that the source light will be white, or of approximately equivalent intensity across the spectrum. If the light isn’t a pure white source (which is the case with all artificial lighting), then the spectrum that results will look like a slightly different color. 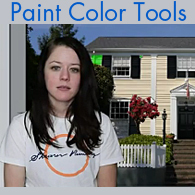 For example, red paint, when looked at under a blue light, may look black. Red paint is red only because it reflects just the red components of the spectrum. Blue light, which doesn’t have any of these, will have no reflection from red, which makes it look black. Structural colors – These are colors created by interference effects – not pigments. Color effects come to be when a material is “scored with fine parallel lines, formed of one or more parallel thing layers, or otherwise composed of microstructures on the scald of the color’s wavelength.” When these microstructures are randomly spaced out, the light of shorter wavelengths will be scattered as wanted to produce Tyndall effect colors; for example, sky blue (Rayleigh scattering, which is caused by structures tinier than the wavelength of light – in this case, air molecules), opal luster, and the blue of human irises. If these microstructures are made to be aligned in arrays – like the array of pits in a CD – they behave as a diffraction grating. This grating reflects various wavelengths in many directions due to interference phenomena, which separates mixed “white” light into light of unalike wavelengths. If the structure is one or more thing layers, it will reflect certain wavelengths and transmit others, depending on the layers’ thickness. To study structural color, you’d have to look at the field of thin-film optics. To more easily understand it, think about how the most ordered or the most changeable structural colors is iridescence. Structural color creates the blues and greens of the feathers of many birds (like for example, a male peacock), as well as some beetle shells and butterfly wings. Pattern spacing variation often creates an iridescent effect, like in peacock feathers, films of oil, soap bubbles, and mother of pearl, since the reflected color depends upon the viewing angle. Several scientists have carried out research in butterfly wings and beetle shells, including Robert Hooke and Isaac Newton. Ever since 1942, electron micrography has been employed, furthering the creation and development of products that use structural color, like “photonic” cosmetics.